The District of Columbia law/code requires the installation and maintenance of smoke alarms and carbon monoxide alarms in buildings with residential occupancies in the District of Columbia. Both property owners and tenants have responsibilities to ensure that all District residents remain safe in their homes from the dangers of fire and carbon monoxide poisoning. The District of Columbia Property Maintenance Code (2013), referred to as the “Property Maintenance Code,” requires the installation of carbon monoxide alarms in all new and existing residential and institutional dwelling units with a carbon monoxide source, including but not limited to apartments, condos, one and two-family houses and townhouses, dormitories and residential institutions. DCRA will begin enforcing this regulation in March 2017. To view the Updated Property Maintenance Code, click here. 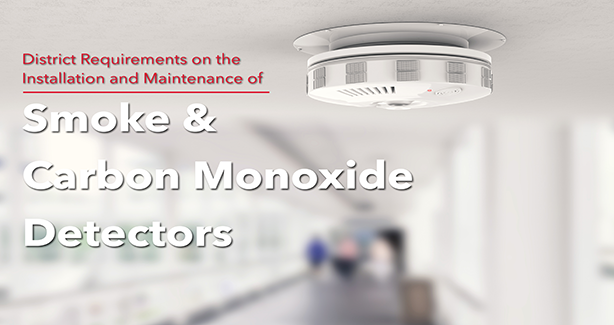 Effective March 28, 2017, DCRA will begin enforcing the requirements pertaining to the installation and maintenance of smoke detectors and carbon monoxide detectors. During the initial period, from March 1 through September 30, 2017, DCRA will be educating the public about the transition and inspectors will begin issuing “warning” notices to persons that are not in compliance with the Property Maintenance Code (2013). Beginning October 1, 2017, inspectors will issue a “Notice of Violation” to property owners failing to comply with the code. The Notice of Violation shall carry a potential fine. If the violation is not corrected within the specified timeframe, it could result in an actual civil infraction fine. Education and outreach to partners, customers and District residents and business owners. Inspectors will begin issuing “warning” notices to persons that are not in compliance with the Property Maintenance Code (2013). Inspectors will begin issuing “Notice of Violations” to property owners failing to comply with the code. The Notice of Violation shall carry a potential fine. Click here to see the updated requirements. Click here to view the carbon monoxide frequently asked questions. In any existing building with dwelling units, that has either fossil fuel, burning equipment or an attached enclosed garage, a carbon monoxide detector must be installed in the immediate vicinity outside of each sleeping area or grouping of bedrooms in the dwelling unit with very limited exceptions. All existing residential buildings that contain sleeping units or dwelling units must have a smoke alarm installed in every room used for sleeping purposes, on the wall or ceiling of each separate sleeping area in the immediate vicinity of bedrooms, and one on each story within a dwelling unit including basements and habitable attics. In split levels, not divided by a door, the upper level alarm serves as the lower level alarm. In new buildings, all the alarms have to be hardwired with battery backup (subject to certain exceptions), and if more than one smoke alarm is required to be installed within a dwelling unit, they have to be interconnected so that if one goes off they all go off. Existing buildings are allowed to use battery powered smoke alarms without physical interconnection, but are required to provide hardwired interconnected smoke alarms in compliance with the requirements applicable to new buildings where work is being done that results in the removal of interior walls or ceiling finishes exposing the structure, or where there is an attic, crawl space or basement available that could provide access for hardwiring without removal of interior finishes.